Here’s what happens when you marry the man of your dreams…with a mother who cooks like an Italian chef. First, you try, try, try again. Every meal you make is silently compared to the mother-in-law’s, and you know you likely will never win. Until you make something that mother-in-law doesn’t specialize in. Then, you’re golden. But then you are somehow in competition with your brother-in-law who lives in a foreign country across the ocean. Because he specializes in that meal, too. I married an Argentine with thick Italian blood running through his veins. His mom doesn’t have Italian blood, but she sure learned to cook like one! Everything she makes is delicious, and I try to watch her and take notes as she cooks, but my food never turns out just like hers. It’s a dilemma I’ll never understand. Fortunately, she doesn’t really specialize in making homemade pizza. That is where I feel like I have won the cooking award in this family. But then there’s my brother-in-law in Spain who apparently cooks a mean pizza himself, so when we meet it’ll be a dual to remember! The first time I made homemade pizza was 4 months into our marriage (over 7 years ago). I thought I followed the recipe, but it came out all doughy in the middle. Now that I look back, though, I think it had a lot to do with the pan I was using to cook on and the temperature of the oven (which was probably off by 25 degrees). Thus started my quest to get my pizza dough to perfection. Over the next few years, I tested several different pizza dough recipes, but none of them even came close to the one I’m about to share with you today. This pizza dough requires two very special ingredients for Italians: oregano and garlic. A winning combination, and such a wonderful taste in homemade pizza. Besides the taste, the main reason I love this pizza dough so much is because it’s a cinch to make. Rising time is a total of 50 minutes, and cooking time is less than 15 minutes. 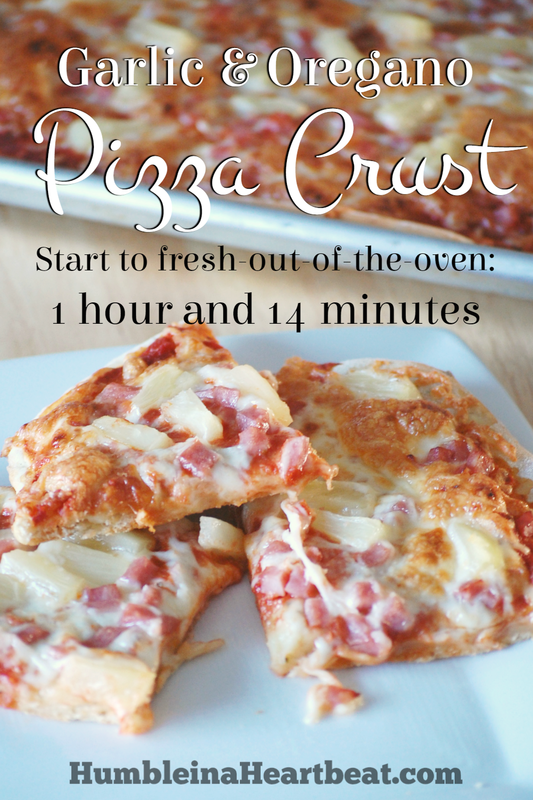 If you have a stand mixer, you should be able to get homemade pizza within 1 hour and 14 minutes. That’s a relatively short wait, mind you. Add all the ingredients, in order, to the bowl of a stand mixer. Mix with the hook attachment until all the ingredients come together to form a ball. If it is too sticky, add a small amount of flour. If it is too dry and the ingredients are not coming together, add a little more water. Continue to knead with the hook attachment for 2-3 more minutes. Put a little oil in the bottom of the bowl and take the ball of pizza dough and turn it over in the oil so all sides are coated in oil. Put a towel over the bowl and let the dough rise for 30 minutes (or more if your house is on the cool side) until the dough has doubled in size. Sprinkle some flour on a clean surface, punch down your dough, and put the dough onto the floured surface. Split the ball into two halves and set aside one half. Work with one ball of dough by first flattening it with the palms of your hands. Add flour as needed if it sticks to the table. 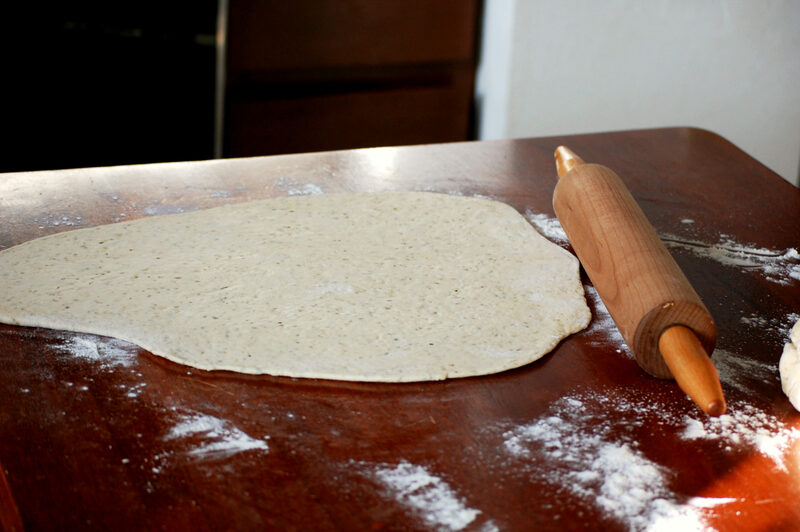 Use a rolling pin to roll the dough out into the shape that you would like. You can do a circle if you have a pizza stone or a pizza pan. Since we use a baking sheet, I roll it into a weird shaped rectangle, and reshape it once I put it on the pan. Lightly oil a heavy baking sheet. Put the dough onto the baking sheet, then cover with a towel and let rise for another 20 minutes. Now top your pizza with everything you want to put on it. Put it into the preheated oven and set the timer for 13-15 minutes. I always go with 14 minutes, but that’s because I know my oven cooks it just right in that amount of time. 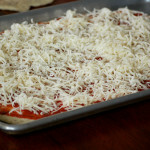 While that pizza is in the oven, roll out the other pizza dough half and let it rise for 20 minutes. Continue as you did with the first half. 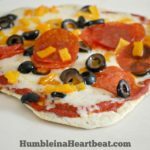 After you add all the toppings, pizza sauce, and cheese, one pizza should cost you less than $5 and it will taste a lot better than ordering pizza or heating up a frozen one! We almost always have leftovers of this pizza, and the only way we will eat it is if we reheat it in the oven. The microwave makes the dough taste strange and soggy. I just preheat the oven to 250-300F, put some pizza slices on a baking sheet, and toss it in the oven for 10 minutes. Oh, and this pizza wouldn’t be complete without the opinions of my trusted advisors. They are responsible for taste-testing and giving the thumbs up. 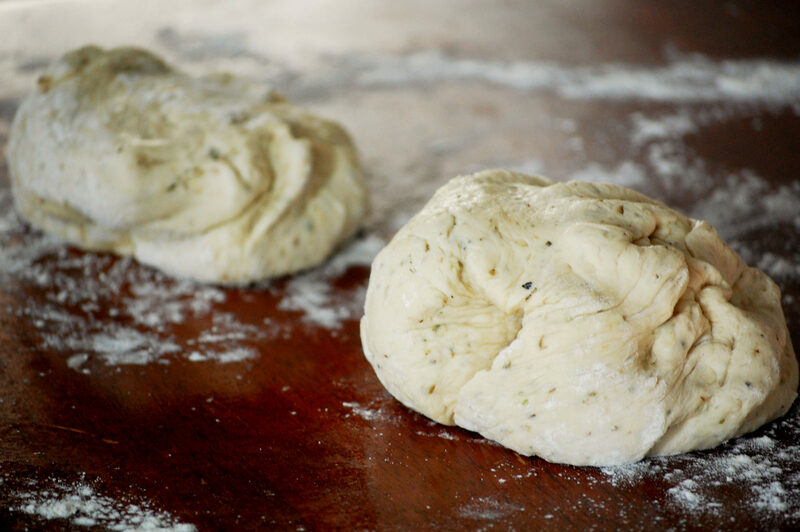 This Garlic & Oregano Pizza Dough is truly fool-proof. Why? Because it uses instant yeast, which is much easier to work with than active dry yeast, in my opinion. You don’t have to know a thing about yeast to make this (except for the fact that the water should be warm, but not HOT). Also, most homemade pizza would taste 1000% better if you had a pizza stone to work with. But using a baking sheet with this dough has always yielded wonderful results for me. So what are you waiting for? 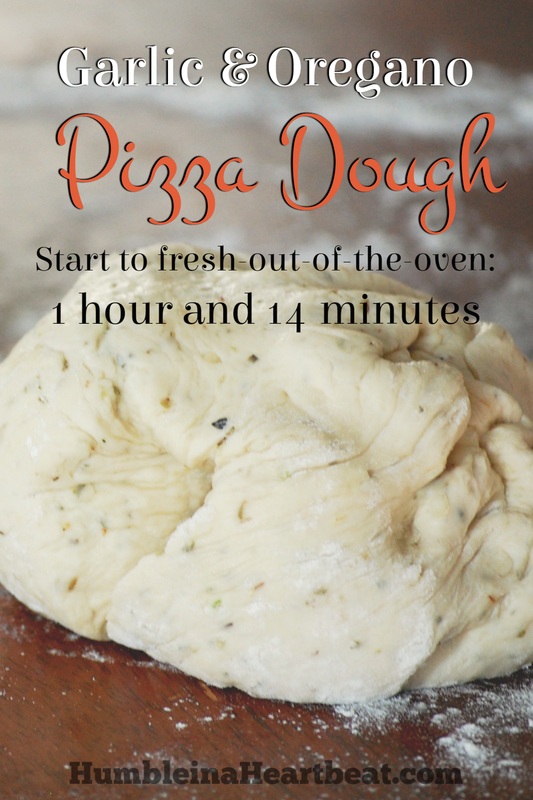 Go get started making this dough for pizza tonight! Add all the ingredients to the bowl of a stand mixer. Mix with the hook attachment until the ingredients come together to form a ball. If it is too sticky, add a small amount of flour. If it is too dry, add a bit more water. 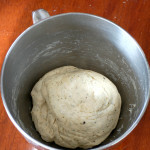 Put a teaspoon or so of olive oil in the bottom of the bowl and roll the ball of pizza dough in it, coating all sides. 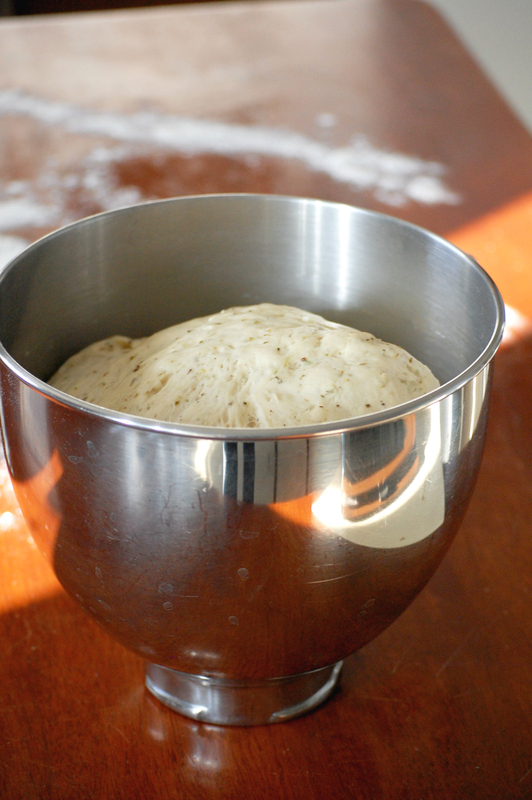 Place the ball of dough in the bottom of the bowl, and cover it with a light towel or plastic wrap. Let the dough rise for 30 minutes, or until it has doubled in size. Sprinkle some flour on a clean surface, punch down your dough, and put the dough onto the floured surface. Split the dough into two halves and set aside one. Work with the first half by gently flattening it with the palms of your hands. Add flour as needed if it sticks to the table. 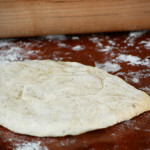 Use a rolling pin to create a round dough, or whatever shape you’d like. Lightly oil a heavy baking sheet. Place the rolled out dough onto the baking sheet. Cover with a towel or plastic wrap and let rise another 20 minutes. While it is rising, prepare your toppings, including sauce, cheese, pepperoni, olives, sausage, peppers, etc. 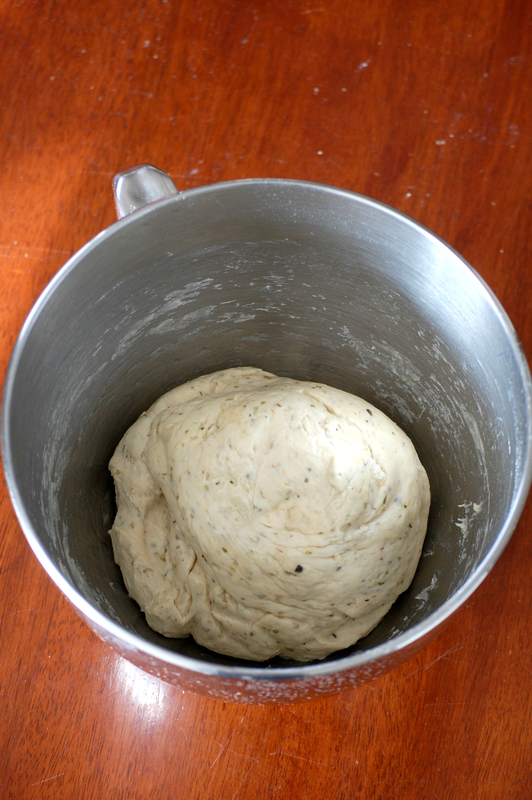 Once the dough has had its second rise, place all the toppings on it. Put into the preheated oven and bake for 13-15 minutes. 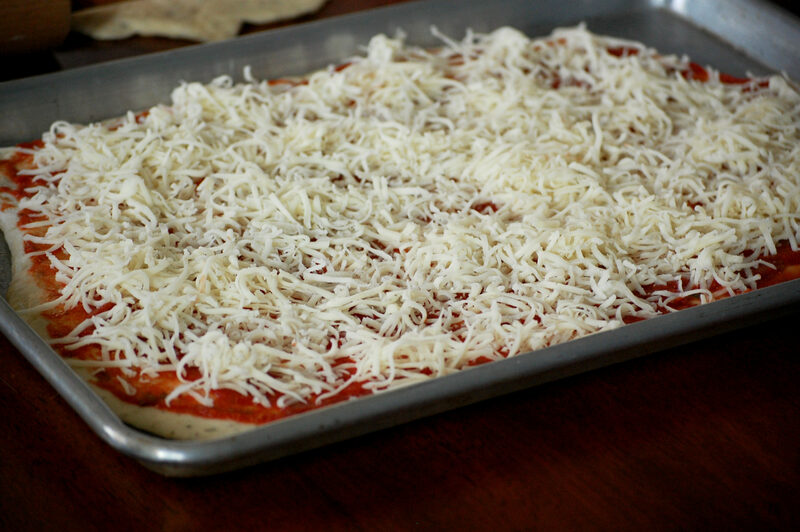 While the first pizza is in the oven, start working with the second pizza dough half so it’s ready to get in the oven soon after the first comes out. If you have leftovers, the best way to reheat them (IMHO) is in the oven. Preheat the oven 250-300F, place some slices on a baking sheet, and toss in the oven for 10 minutes. 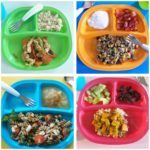 Yep, it’s hard to compete with MIL cooking! 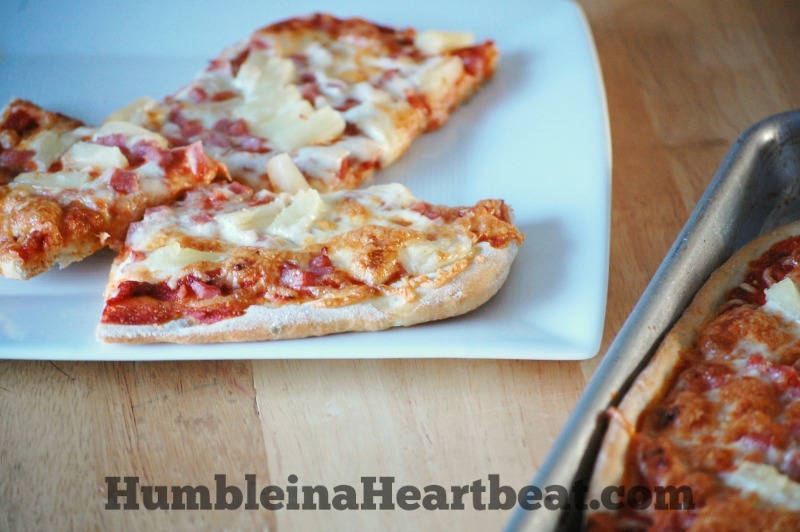 That crust sounds perfect for next pizza night, especially since I’m stuck in a rut making the same pizza over and over (but it is a favorite). 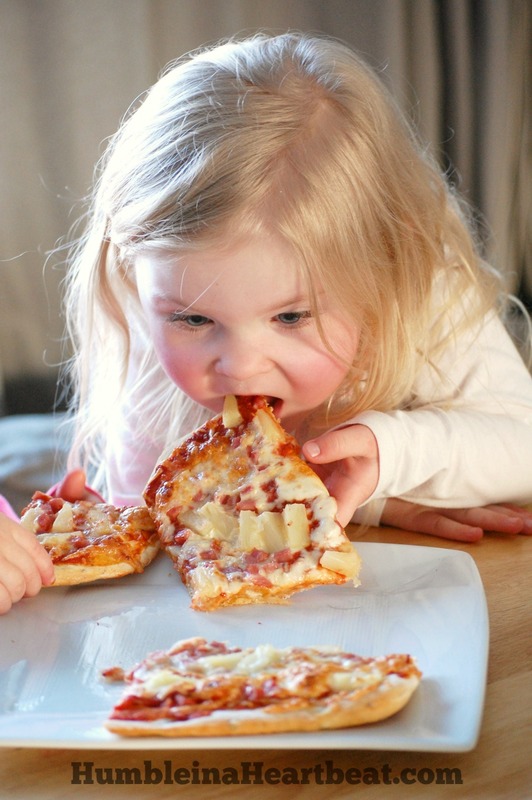 Hahaha- we noticed today that the girls pick up and eat their pizza backwards (like in the above pic)! Yes, try it! It’s not hard to do at all. But you’ll have to tell me how it goes without a stand mixer. That is way too funny. I honestly had never really noticed that, but now that you mention it I have seen them do this. 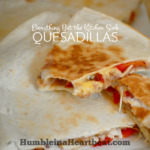 They even do it with quesadillas. Ha! I think with pizza, they are going for the crust first since they love bread! I made the pizza tonight and was great! Tried many pizza doughs and this one tasted great and had a nice crisp bottom that didn’t fall apart when you picked it up to eat. 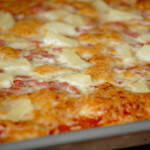 Thanks so much for the recipe from me and my pizza living family. Your dough made the dish! It was so tasty. Thank you! Wonderful, Joni! I’ll have to try that Pizza Braid now! I made this dough and the texture and look of it was amazing but tasted a little flat. Is it because I used bread flour? The yeast was perfect. I used Kosher salt. Should I have used another salt? I always use kosher salt for this pizza dough. The flat taste could be that there wasn’t enough salt for your taste, I guess. I don’t think the bread flour would alter the taste. I’ve had the exact opposite comment saying that it was too salty, so really it’s a matter of preference. It could also be the pizza sauce you use. 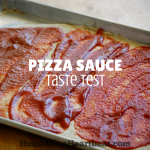 I’ve noticed that the sauce can make or break the taste of the crust. Thanks! I asked someone else who makes their own pizza dough (a home cook) and they said the same as you try a tad more salt. I really liked your recipe over others so I will try again just add more salt. Now the pizza sauce I made a mushroom pizza with a white sauce…that could be it too. I will keep you abreast. Thanks for replying! Yes! I have frozen 4 now. 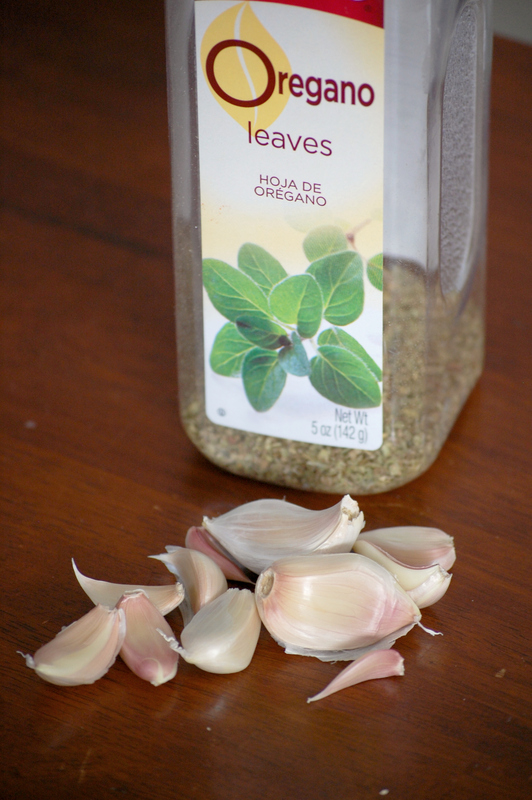 I thawed one a few weeks ago and tried it, and it tastes exactly the same. I froze it after the first rise, but lately I’ve been freezing it right after mixing everything together. It’s up to you. Did you roll your pizza dough out and/or bake it before you freezed it? I did not. I just made the dough, wrapped it up and put it in a ziploc, then put it in the freezer. When I pulled it out I let it rise. Although, I think next time I do this I will let it rise the first time and then put it in the freezer. I’m sure it would work to bake it before putting it in the freezer as well. Awesome! So glad it worked out for you. Can I substitute all purpose flour with whole wheat flour? I’ve never tried it. I think you could start by adding half whole wheat and half all-purpose and then keep increasing from there. I am sure you will find that it is much more dense, though. Thankyou for the reply Charlee.I tried the all purpose flour recipe today and it was yummy! I made the second suase and my son loved the pizza.The garlic and oregano touch was awesome.Thankyou again. Ooh, breadsticks sound wonderful. So glad it worked out for you! Hello… I am Trying this pizza tonight…what if we don’t own a stand mixer? Would our hands work the same way?? I have never tried it without a stand mixer, but I know you can do it. I would add all the ingredients to a large bowl and stir with a wooden spoon first. Once the ingredients have come together to form a dough, dump it out onto a floured surface and knead for at least 10 minutes until the dough becomes elastic. Hopefully that works. Let me know! just wondering, is the baking powder really necessary in a yeast bread dough? I’ve never seen a pizza dough with baking powder before. What is the purpose? Thank you so much for the recipe. It is awesome!!!!!! Best pizza dough I’ve ever made!!!!!! That’s great, Terry! Thanks for letting me know. 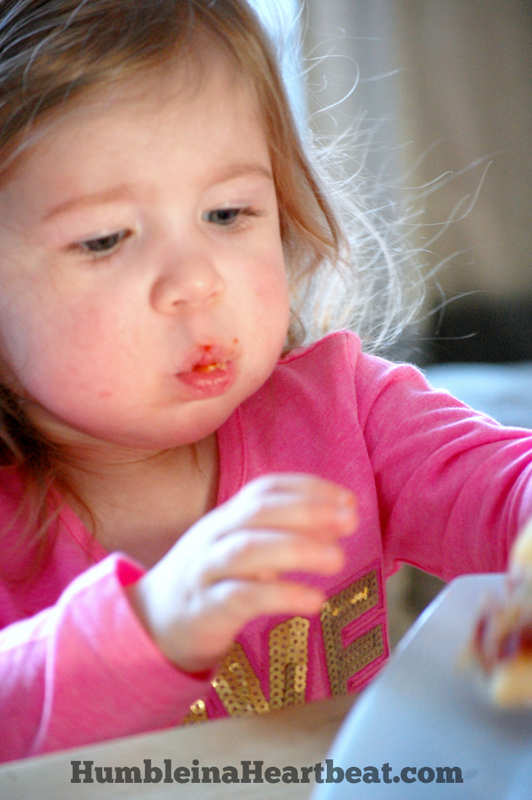 Dear Charlee, thank you so much for sharing your absolutly yummy pizza recipe! Your instructions were great to follow and the result came out very tatsy. 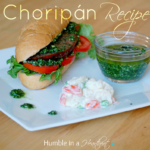 Can’t wait to try more of your recipes ? 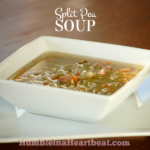 I pinned this recipe ages ago and have since made it 10+ times. 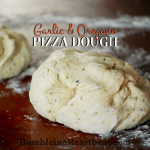 It is my all-time favorite pizza dough and is so so easy to just throw everything into the mixer. I love it. Thanks so much! Oh, that’s great, Michaela! I love how easy it is, too. Can this recipe be done with active dry yeast? I don’t have instant & was hoping to use this dough for Stromboli tonight! I’m pretty sure you can, but you will have to proof the yeast before mixing in the other ingredients. You will also probably have to let it rise for at least an hour. Here’s what you can try (just know I’ve never tried doing it like this before): Put the yeast and water (105-115 F) in first, along with 1/2 tsp. sugar. Let the yeast proof (it will start to get foamy on the top) for about 5 minutes. Add the rest of the ingredients as directed in the recipe. Then just increase both rise times. Hope it works! Made this dough the other week. VERY DELIVIOUS!!!!! Even used the left over dough to make bread topped with coarse sea salt. YUM. Just wrote this into my recipe book that I’m writing for my kids.